Sargis Sargsyan suffered a second-round defeat in Milan. Two skaters representing Armenia participated at the 2004 European Figure Skating Championships held in Budapest, Hungary, from February 2 to 8. Performing at the Budapest Sport Arena in the pairs ice dancing category, Anastasia Grebenkina and Vazgen Azrojan took 13 th place out of 22 competitors. In total 31 countries participated in the championships. After the Australian Open championship came to its end three tournaments of the International Series started on February 9: the Indesit ATP Milano Indoor 2004, Siebel Open and Bellsouth Open. Sargis Sargsyan representing Armenia chose to fly to Italy to compete in the five-round tournament in Milan. Sargsyan, seeded 7, defeated Andreas Seppi from Italy 6-1 6-4 in the first round. But he was well beaten by Slovakian Karol Kucera in the next round, 6-2 6-1. 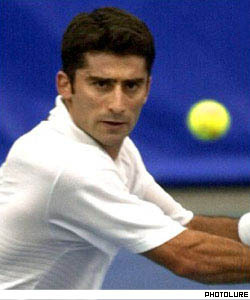 In the doubles category, Sargsyan teamed up with Serbian player Nenad Zimonjic. The pair, seeded 4, lost 6-7 (6), 6-3, 3-6 to Sweden 's Thomas Johansson and Johan Landsberg. Meanwhile Andre Agassi preferred to stay at home by entering the Siebel Open in San Jose, California. In the first round Agassi, seeded 2, beat Georgia 's Irakli Labadze 7-6 6-4 in the first round before advancing to the quarter finals by defeating South African Wesley Moodie 7-6 (6) 6-4. Agassi has won the Siebel Open five times, in 1990, 1993, 1995, 1998, and 2003. Street Fighting: Residents say they are paying the price of Yerevan 's prestige landmark. Home from home: Citizens of Armenia are forced to leave Turkmenistan. You wait 12 years for a baby and then three come along at once...Karina Maisuradze-Gevorkyan became the proud mother of triplets, two girls and one boy, on February 5 at Yerevan's Maternity Research Center. Karina had been trying to have a child for 12 years without success before approaching the center and undergoing fertility treatment.